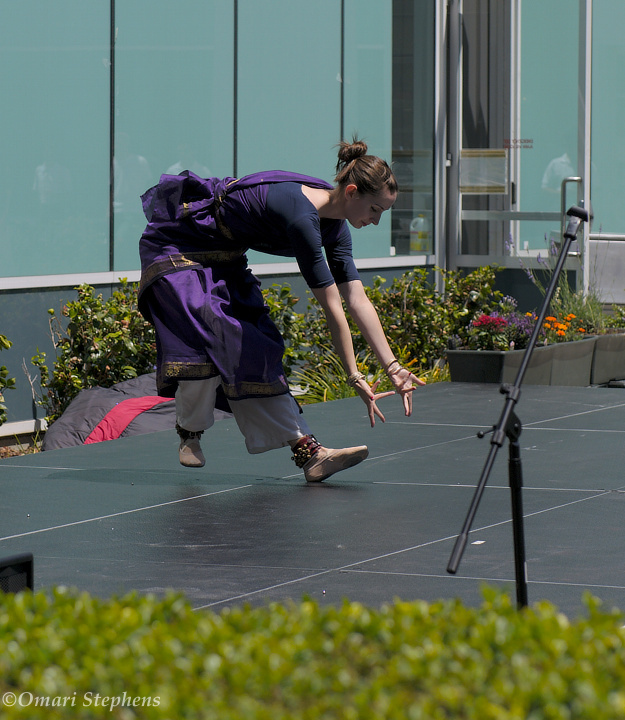 Last Thursday, the Googleplex saw witness to Google Mela ("gathering" in Sanskrit), a googler-organized international cultural festival. 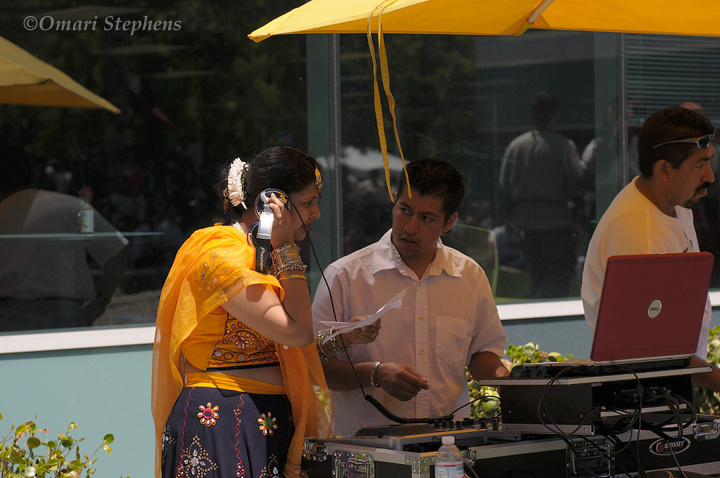 The festival celebrated cuisines, music, and dancing from various cultures around the world. 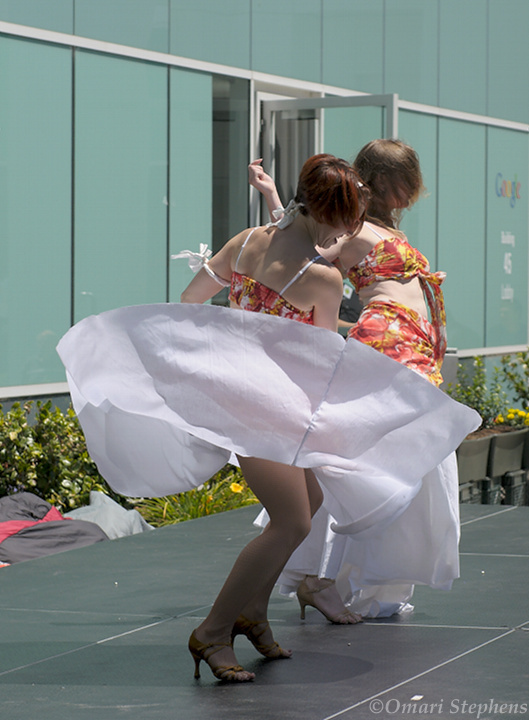 Here, a dancer whips her skirt around as she and her partner perform a Haitian salsa. Standing on the side, I was able to watch the upcoming performers prepare while others were onstage. I found it intriguing that the preparation routines varied nearly as much as the performances — some people stretched, others ran through quick final practices, and still others had short team meetings of sorts. 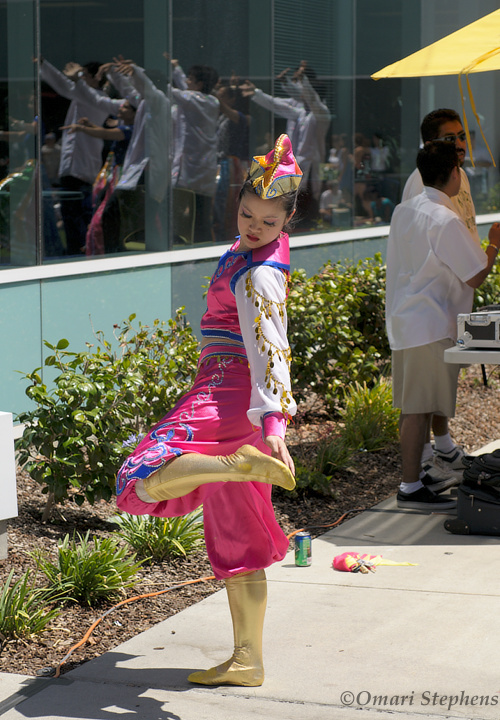 This woman, who would perform a Mongolian chopstick dance, gives part of her outfit a few last tugs during the closing minutes of the Bollywood Medley group's performance. 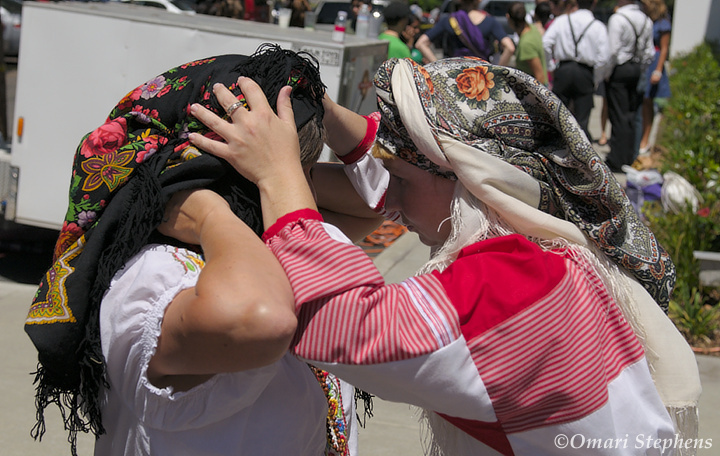 These singers from Kostroma, the folk ensemble of Russian House Kedry, spent a couple minutes getting the black headdress to look just right. 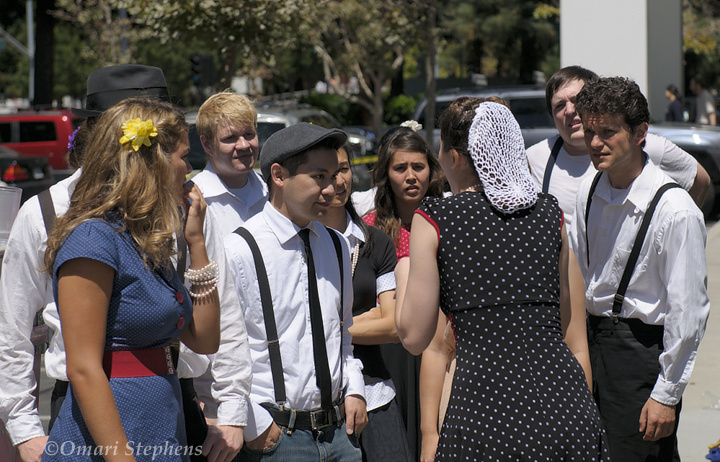 Here, the Shim Sham Swing dancers have a final group huddle before heading onstage. The sun was beating down ruthlessly through a cloudless sky all day long. (To get an idea for just how bright it was, I shot this image at 1/4000s at f/4.5 and 200ISO.) 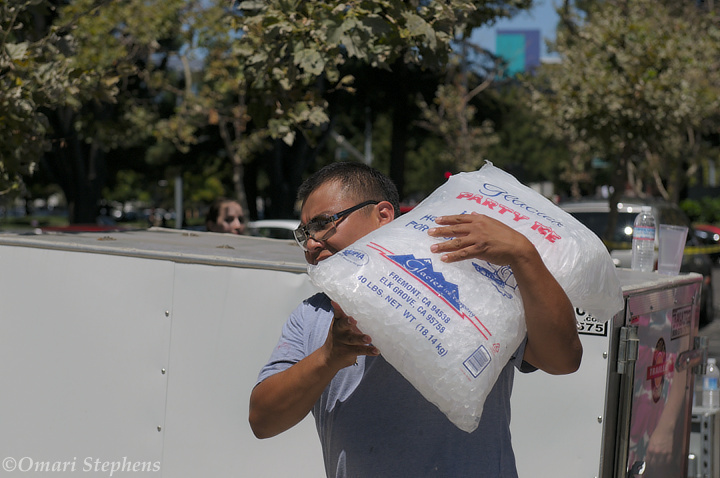 An insulated trailer held a bunch of large bags of ice to keep drinks (and presumably cold-served food) chilled. The performers had no such reprieve from the grill-like black stage, however. I spotted a friend and coworker of mine wearing shoes that were too large and walking awkardly on the sides of his feet, and he explained that he had slightly burned the soles of his feet during an earlier (presumably shoeless) performance. Another member of his second performance group received a much-appreciated donation of socks moments before they were called to the stage. A woman performs the Bharatanatyam, a classical south-Indian dance form. One thing I found interesting about this dance were the stiffness of the movements. Whereas many dances strive for fluidity, it seemed that the goal here was to maintain a certain type of posture, with extremities generally extended to the sides or straight ahead, throughout the dance. It was an unfamiliar dance style, but I enjoyed it. 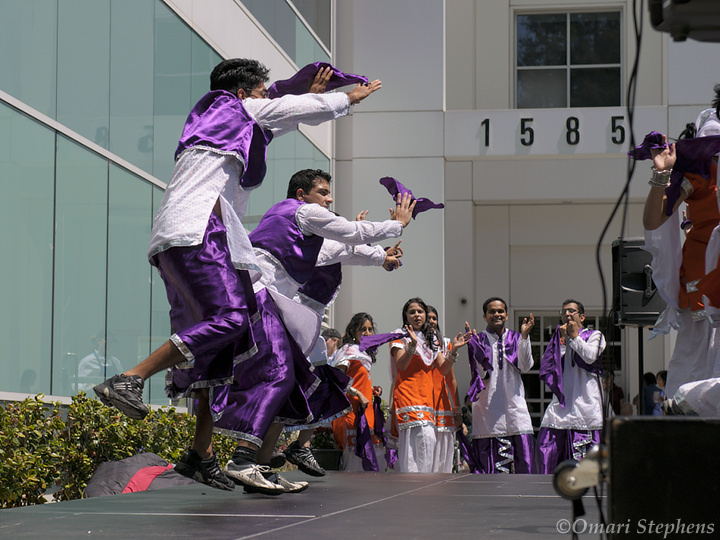 In a short false-start, the Shim Sham performers initially got a few seconds of Bhangra music at the beginning of their performance. Here, one of the Mela organizers screens the upcoming music during Kostroma's folk singing performance. 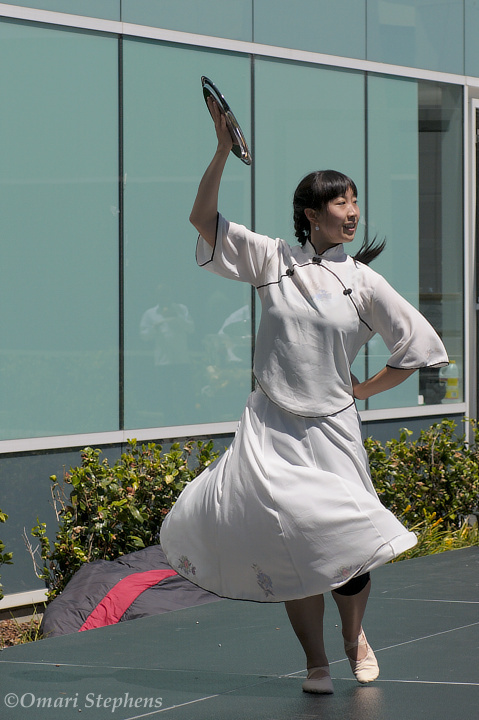 A woman performs a Chinese silver plate dance, in which she deftly holds a silver plate on her palm while dancing. Interspersed in the physics, balance, and hand-switching displays, she also danced while holding the edges of the plate with both hands. And during a short section of the dance, it looked as if she could have held two plates, though she only had one. Unfortunately, I was only able to find three webpages with mentions of this dance (1, 2, 3), the second of which may actually be discussing another kind of plate dance. If you know of a source of more info, I'd be delighted to find out; leave a comment. Beautiful, as always! Sounds like you are having a good time in CA! Wow! I saw your camera and knew your photos would be good, but these are great quality work. It is so difficult to shoot dancers and get clear photos that look good (let alone with good facial expressions!) Thank you for sharing. =) Anna - the AfroHaitian salsa chicka. Ramya: Gracias. And I certainly am having a good time. Anna: Thank you; I work hard to take the best photos I can. I'm a big salsa fan, and I really enjoyed your dance. I, too, must say these are fantastic pictures. I love that you capture the true feel of what is was like to have been there. You have a natural talent for seeing things that make is so real. Thank you for sharing!